In June 2018, as part of a 5-city, 1600 mile road trip, I drove to 1000 Islands and Alexandria Bay in upstate New York. There, I visited Boldt Castle and went on a riverboat cruise. The next city was Toronto where I just had to take pictures from atop the CN Tower which, at 1815 feet, is the tallest free standing structure in the Western Hemisphere. From Toronto, it was off to Niagara Falls. I first visited Niagara Falls fifteen years ago in 2003 and have always wanted to return. I visited all of the same sights from 15 years ago – the bird sanctuary, butterfly conservatory, the beautiful gardens, and of course, the Falls. 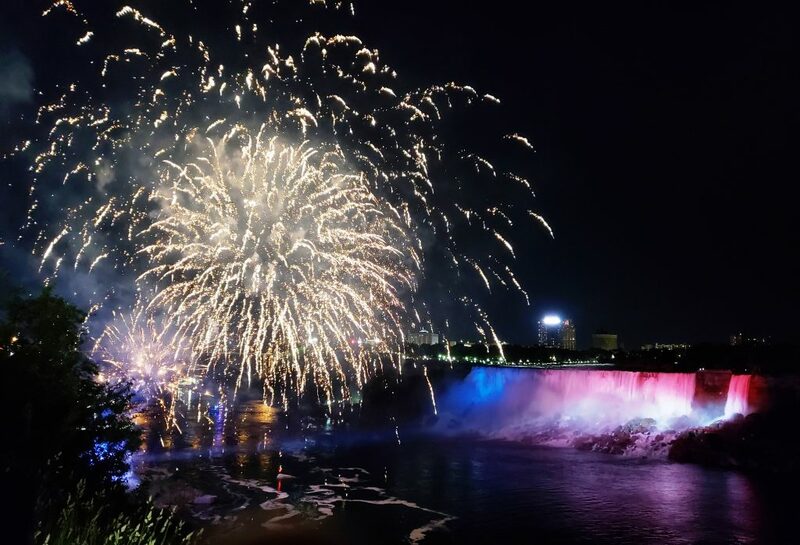 Some of the newer sights include a ferris wheel, zip lines, brighter LED lights that illuminate the Falls with brilliant colors at night, and the fireworks show as seen in the picture above. Combine all of that with a ride on the Maid of the Mist and exploring both the US and Canadian sides of the Falls, it can be a fun 3 to 5 day adventure. Check out the photos of Alexandria Bay, Toronto, and Niagara Falls and let me know what you think. I’m always happy to reply. In November of 2017, I traveled to Harrisonburg, Virginia and drove along Skyline Drive in Shenandoah National Park to view the late fall colors of the Blue Ridge Mountains. On my way home, I did a quick first tour of Philadelphia – a city so full of rich history and a perfect blend of new and old architecture. I plan to return to Philadelphia soon, not only for another Philly cheesesteak, but to visit their many museums and historic sites. You can see these photos in the Virginia and Pennsylvania galleries of this website. In May of 2017, I returned to the Southwest visiting several cities and national parks in Nevada, Utah, Arizona, and New Mexico. The first stop was Las Vegas. I am not a casino gambler but it was interesting to see the various casinos that shine like royal palaces. Next was a visit to the marvel of construction called Hoover Dam. Then, there were the canyons and national parks: Red Rock Canyon, Zion and Bryce Canyon National Parks, Glen Canyon and its dam, Horseshoe Bend, and the greatest wonder of them all, the Grand Canyon! From there, I visited four towns in Arizona: Jerome, Sedona, Winslow, and Gallup. And finally, the trip wrapped up with Santa Fe and Albuquerque in New Mexico. You can see these photos in the Nevada, Utah, Arizona, and New Mexico galleries of this website. In August of 2016, I visited seven cities in Spain and France in a short span of 15 days. First stop was a lovely town in France called Carcassonne. Our hotel was directly across the street from the Carcassonne Fortress, a beautiful castle-like fortification used to protect the residents from attacks and invasions. From there, we moved on to Granada, Spain and the Alhambra, another magnificent fortress and palace. Next stop was the city of Barcelona to see the church of La Familia and other structures by Spain’s most famous architect, Antoni Gaudi. It was then on to a resort, beaches, and great food of Marbella. A dramatic change of pace and scenery was the town of Ronda – home to Spain’s oldest bullfight ring. But that was not the only attraction! The city of Ronda is situated over a deep gorge so the downward views were just jaw-dropping! From Ronda, we traveled by high-speed train to the city of Madrid with more stunning architecture, great food, and friendly people. And finally, we took a day trip by train to see the town of Toledo. As soon as we stepped off the train, we were mesmerized by one of the most beautiful train stations. The town itself had many surprises such as churches, museums, and spectacular vistas. You can see these photos in the France and Spain galleries of this website. Different cultures are good for the soul, especially when you get the chance to experience them with great friends as we did.